This exceptional jug is unmarked but is identical to a drawing in a catalogue produced by P. Orr and Sons in the 1870s (see below), and can be attributed to the Madras firm of silversmiths. 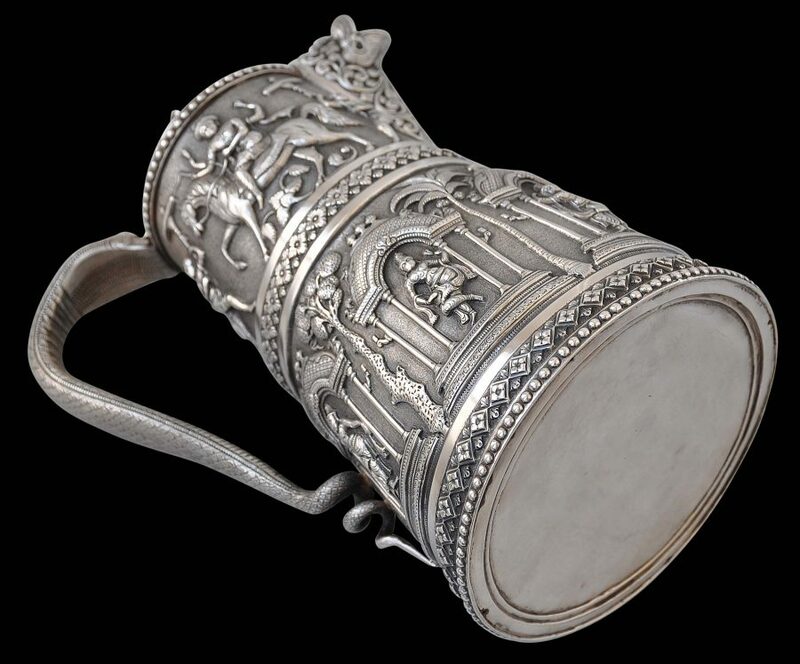 It is a jug most probably meant to serve cold drinking water (as opposed to hot water) as the handle does not have insulators. 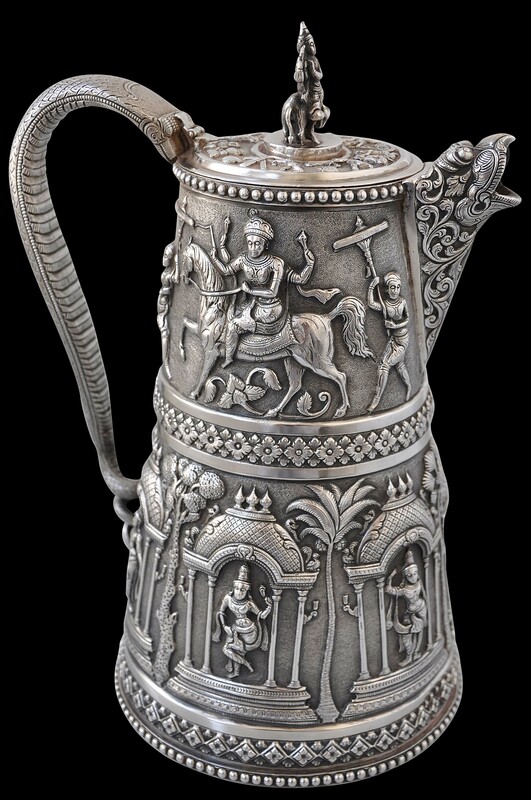 As such the piece most probably was made as a stand alone piece and was not intended to be part of a tea set for example. 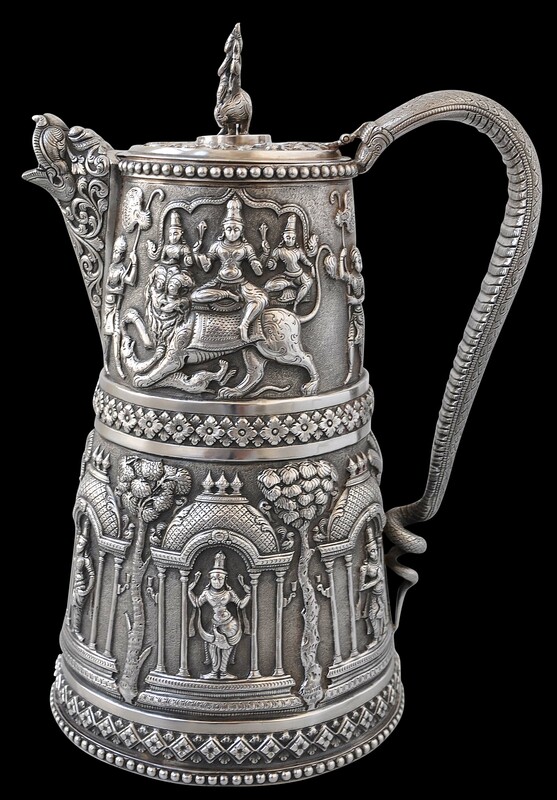 A related hot water jug (which does have ivory insulators in the handle), published on the back cover of Dehejia (2008), formerly was in the Paul Walter Collection and recently was purchased by the Virginia Fine Arts Museum. 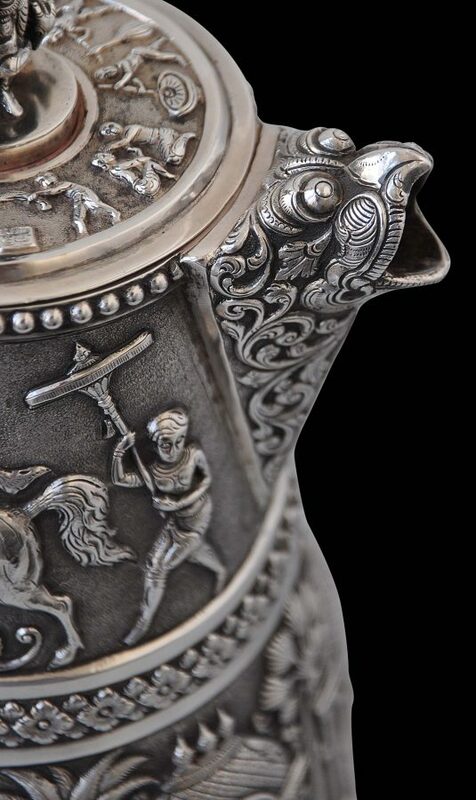 The detail of the example here is more crisp and less polished down compared with the VFAM example. 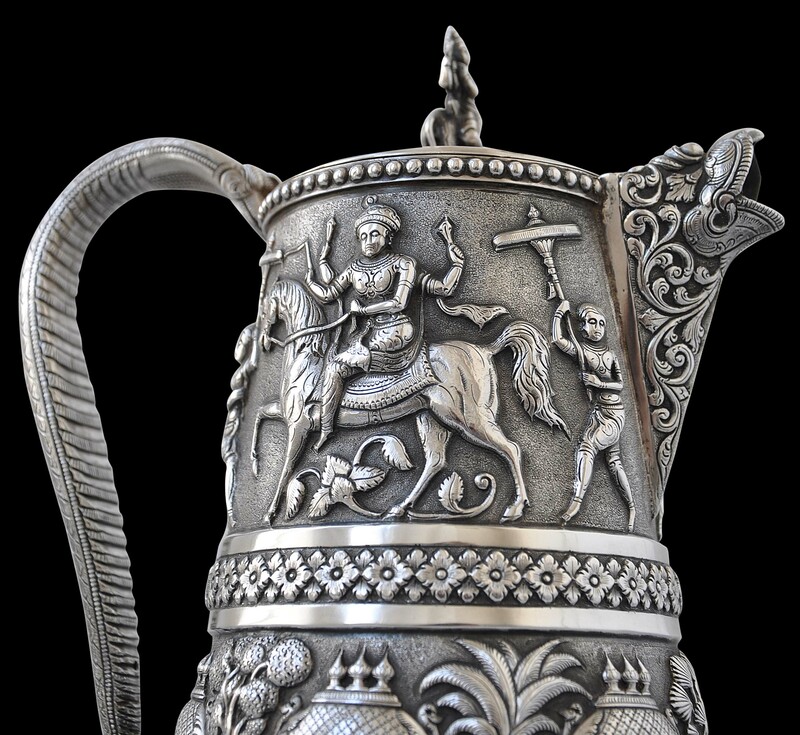 The body of the jug here is made of two silver skins so that the interior is smooth and hides the reverse of the repousse and chasing of the outer skin. 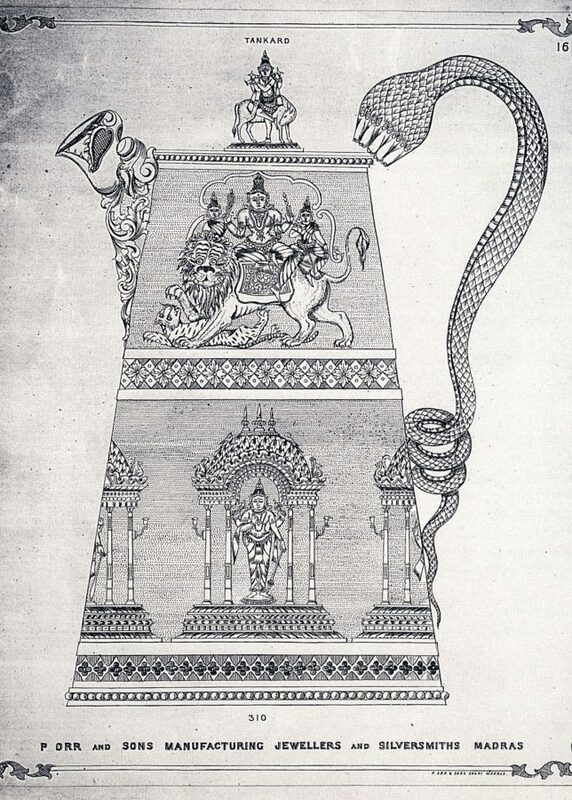 The lower half of the jug is chased with Vishnu holding his club and conch shell and in various other avatars (Vishnu had ten reincarnations on earth.) 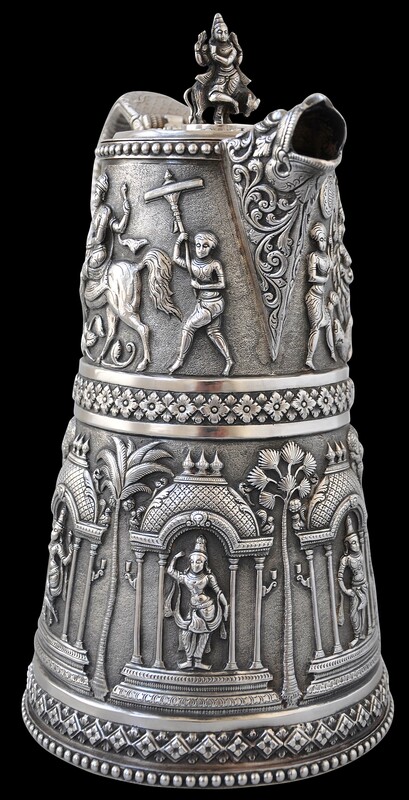 The top half shows Durga (a version of Kali, goddess of death and destruction and the consort of Shiva) riding a lion and in the process of killing a tiger, and another god, with four arms, probably Vishnu, riding a horse. 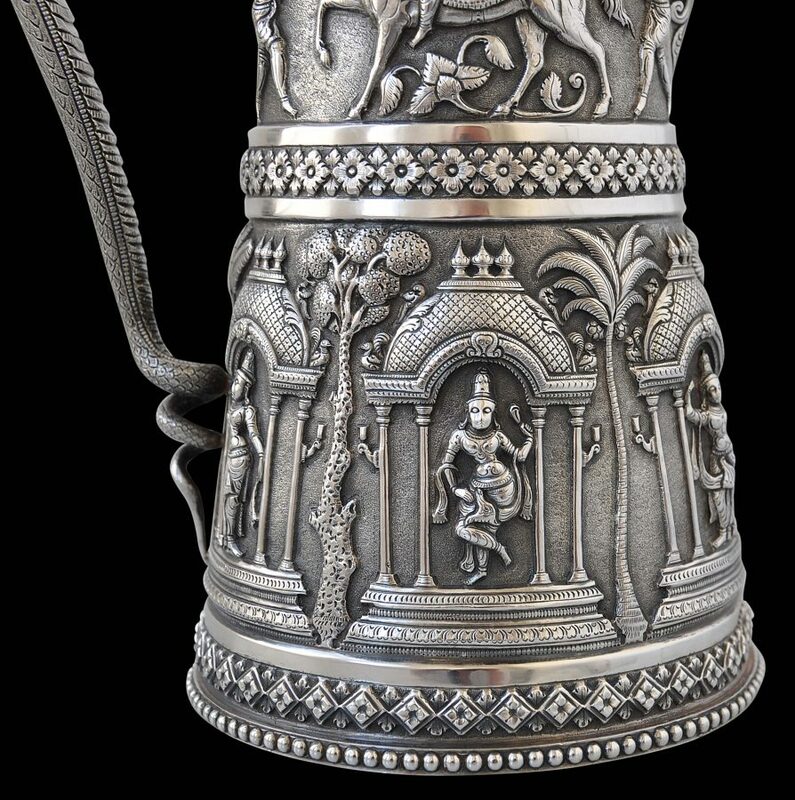 The superb spout is in the form of a makara. 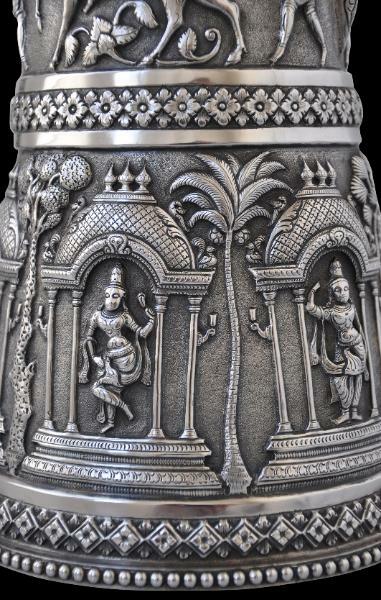 The hinged lid is topped with a solid cast silver figure of Krishna. 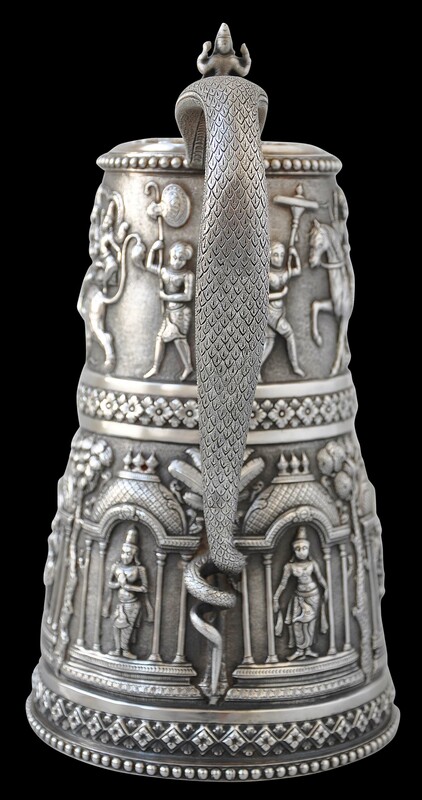 The magnificent handle is cast and incised in the form of a flat-headed cobra. 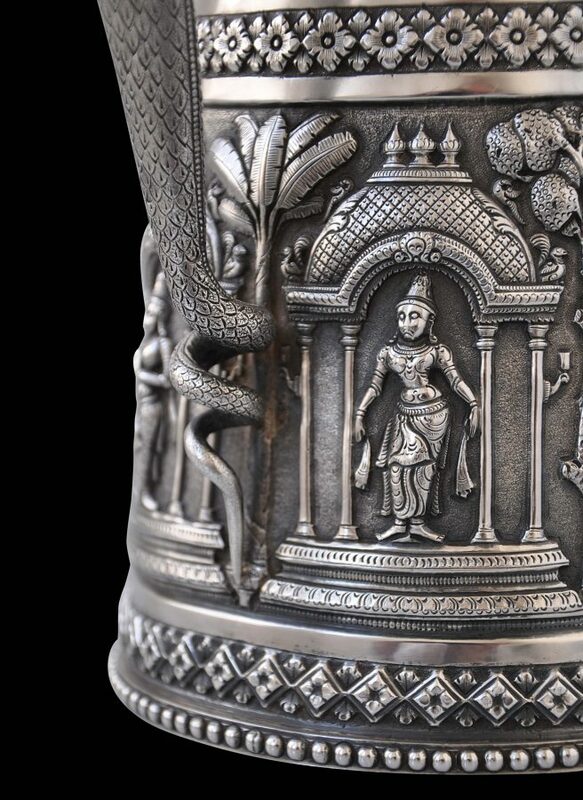 This type of decoration became known popularly as ‘Swami ware’ and was developed by the Madras silversmiths in the latter half of the nineteenth century. 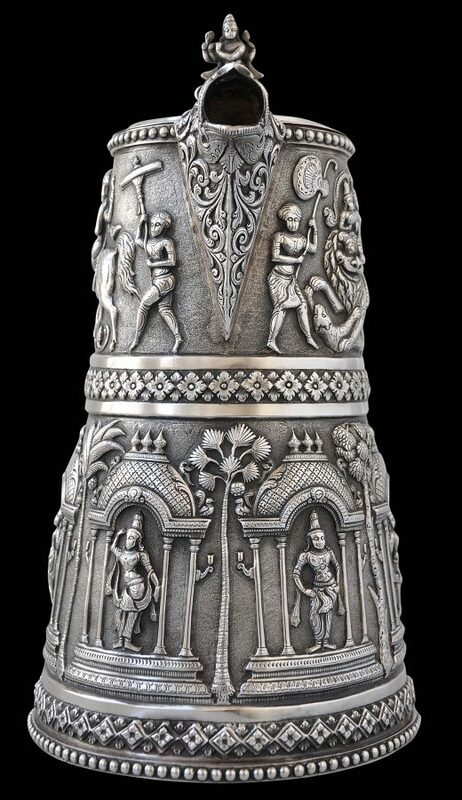 P. Orr & Sons was the best known proponent of this type of decoration. This example is in excellent condition. 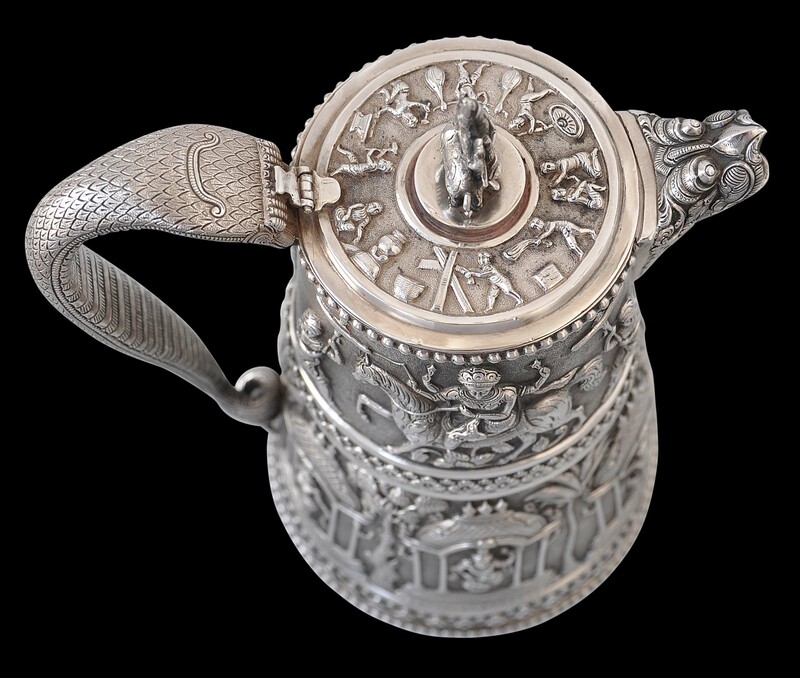 Overall, it is an excellent and important example of nineteenth century colonial Indian silver work.